HH1384 logger is in the end of its life cycle. As a possible substitute & upgrade, please check out Newest Released 8 Channel Thermocouple Data Logger OM-HL-EH-TC Series for more advanced features with better price. 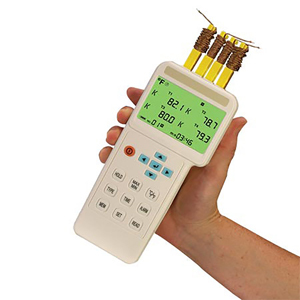 This instrument is a digital 4 input thermometer and data logger that works with any K, J, E, T, R, S, N, L, U, B and C Type thermocouple temperature sensors.